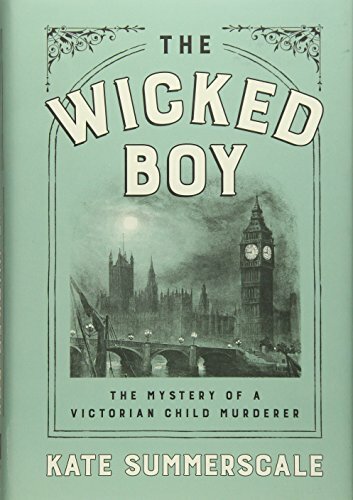 It is hard to wrap one’s mind around a thirteen-year-old child in Victorian England killing his mother, and yet in Kate Summerscale’s book The Wicked Boy: The Mystery of a Victorian Child Murderer she brings exactly that event to the forefront, with unusual results. The book is laid out in great detail, at times almost too much detail, and yet in the entire overview of the event and its aftermath, those details give a perspective to the crime that might otherwise be overlooked. In July 1895, while his father is out of the country, Robert Coombes kills his mother, Emily. Her body is left in the upper bedroom of the family home where it rapidly deteriorates in the heat of the summer. During the following days, Robert, age thirteen, and his younger brother Nathaniel (Nattie), age twelve, take the family’s money and splurge on food and entertainment. They engage the company of one John Fox, a man known to the family who is described as “a half-witted man . . . a rather stupid man.” Yet it is clear from the start that he knew nothing about the murder, even though he stayed with the boys in the home while a corpse deteriorated above them. As the family becomes worried about Emily’s whereabouts, the search begins in earnest and it does not take long for Emily’s body to be found. As the police investigate, Robert coolly and calmly confesses. The reason? He claims he is saving his younger brother Nattie from abuses piled upon him. Questions begin to arise as to the roles played in this event by Nattie and John Fox. The authorities are reluctant to charge Nattie with complicity in the crime and quickly turn him to testify against his brother. John Fox, on the other hand, is charged with participating in the crime, and both Robert and Fox are tried. The short telling of the story is that Robert was tried and found guilty by reason of insanity; John Fox was found not guilty and released. But stories are seldom that easily explained and would certainly not be interesting if they did not contain more depth. And that is what Summerscale excels at: getting into the depth of the story. “More than a million boy’s periodicals were being sold a week.” The St James’s Gazette assigned an analyst to study this problem. After reading 36 titles, he concluded that the “task was ‘repulsive and depressing’” claiming “the writing ‘brutalized my whole consciousness . . .’” While this concept continued through the trial, at the end there was little to say that these periodicals really had any effect on Robert’s actions. Robert was considered by family, teachers, and neighbors to be an exceptionally bright young man who did well in school but suffered headaches and was considered to be volatile. And thus the idea of too much studying was taken into consideration. During his incarceration at Broadmoor, he learned the trade of tailor, participated in musical events, played sports, and excelled at chess. The staff at Broadmoor was especially aware of the impressionability of their younger charges and encouraged them with softer treatment. In 1912, after 17 years at Broadmoor, Robert petitioned for release with the support of the Broadmoor staff, and he was released to oversight of the Salvation Army. By 1913, his brother Nattie was living in Australia, and Robert obtained permission to follow Nattie. By 1914, the world became embroiled in World War I, The Great War, and Robert joined the army as a stretcher-bearer. Again, Summerscale provides great detail about the war and the role he played in the war and the many places where he found himself, including Egypt, Turkey, and France. Upon his return to Australia, he and his brothers-in-arms were treated as heroes. He reconnected with Nattie but lived a solitary life for the most part. The final story of Robert’s life is poignant as Summerscale brings it around full circle. She describes his closing season and the impact he had on the people around him, leaving the question of motive for his mother’s murder open to interpretation. Summerscale has taken her research to many levels of learning for the reader. It’s more than The Mystery of a Victorian Child Murderer—it’s a tale about change. It belongs on every reader’s bookshelf.